Most of the year, Carbondale is a rather idyllic and small college town in southern Illinois. However, twice a year, in May and December, the home of the Salukis turns into one of the biggest destinations in the region, with a bustle that rivals giant communities such as Chicago, New York or Los Angeles when it comes to sold-out hotels, busy restaurants and celebrations associated with the big day of so many graduating seniors. That’s when Southern Illinois University Carbondale hosts its annual commencement ceremony. 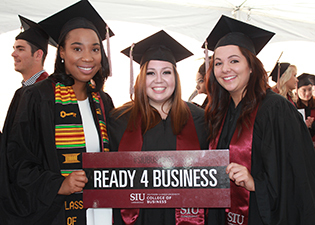 With glamor, pomp and circumstance, the 140th annual graduation ceremony took place May 14 at the SIU Arena. The celebration weekend kicked off May 13 in the SIU Student Center with “Forever SIU,” an event that invited graduates, their families and their friends to enjoy a fun evening that included free food and drinks, live-band karaoke, bowling, billiards, photo booths and the most recent Star Wars movie, “Episode VII – The Force Awakens.” SIU interim chancellor Brad Colwell was there, along with vice chancellors, deans, faculty members and staff, who mingled with students and parents alike. I was among the excited graduates who saw their hard work finally pay off when they received their diplomas from their respective departments the following day. After having watched dozens of fellow students make their graduation walk numerous times before over the past two years, my big day had finally arrived. It was a day of celebration – and the next step in life for the graduating students of spring 2016. For me, it also marked the end of an incredibly beneficial and unforgettable chapter in my life while making room for a new journey, new adventures and a bright future. It is on a bittersweet note, therefore, that I am here to announce this article as my last in my role as marketing graduate assistant of SIU’s College of Business dean’s office. Since joining Southern Illinois University Carbondale in 2014, I have quickly immersed myself in the Saluki culture in my dual role as teaching assistant and marketing graduate assistant with the Department of Kinesiology and the College of Business, while also volunteering with Saluki Athletics. But as the saying goes, “Leave on a high note.” My time in Carbondale has come to an end. With a smile on my lips and a tear in my eye, I am leaving the Saluki nation for a promising future with Disney Co. in Orlando, Florida. Prior to my departure, I joined nearly 700 College of Business and College of Education and Human Services students in walking across the stage during the afternoon commencement ceremony to reap the well-deserved fruits and rewards of endless hours in the library and in the classroom, literally taking the next steps toward my future. At the beginning of the ceremony, Dr. Donald Beggs – a two-degree alumnus from SIU and former dean of the College of Education, before serving as SIU chancellor from 1996 to 1999 and as president of Missouri Valley Conference rival Wichita State University until June 2012 – delivered his inspiring commencement address and equipped us with a few words of wisdom. Also bidding farewell to her chosen home for the past four years was Victoria McGuire, a management senior and former SIU cheerleader. McGuire, a native of Marion, Illinois, and a member of the Accounting Society as well as Beta Alpha Psi, strode toward her next adventure with an open mind. “Until I find my niche, something I am passionate about, I will take whatever starting point and embrace it as a step to finding where I belong,” she said. Fellow management senior Noppadol “Champ” Tuksakulvith, who recently was named the College of Business’ overall outstanding senior at the Honors Day ceremony in April, joined her as another one of the college’s many students who graduated this semester. Tuksakulvith, the founder and president of SIU’s American Production and Inventory Control Society (APICS) chapter, the first supply chain and operations management registered student organization in the College of Business, has set his sights on a career in supply chain management upon graduation, but first may continue his education to obtain his master’s degree. “I also keep graduate school as an option and have applied to SIU’s Master of Science in Quality Engineering Management program, as well as to the Master of Science in Supply Chain Management programs at the University of Texas at Dallas and Nayang Technological University in Singapore,” he said. Another degree recipient was Josh Lohmann, a senior accounting and finance major who served as one of the student co-coordinators for the popular annual SIU Accounting Challenge. His immediate post-graduation plans involve working as audit associate at KPMG’s St. Louis office starting in mid-August. For the long haul, however, Lohmann has two career paths in mind that he views as a means to help him fulfill his lifelong dream. “After obtaining enough capital as either a partner at KPMG or chief financial officer of a manufacturing corporation, I plan to start a beef and crop farm in Nashville, Illinois, and hope to grow it to 500 head and 1,000 acres,” he said. Regardless of which degree or which department we spring graduates belonged to, all of us have one thing in common: We are most grateful for the superior education that we received from the faculty and staff at SIU Carbondale. McGuire, a management senior with a cumulative GPA of 3.88, labeled her Saluki education as “uniqueness.” She said she is particularly grateful for the consistent dedication and care she received from the faculty throughout her four years as a Saluki. While fully agreeing with McGuire, fellow College of Business student Lohmann added another important factor to the equation of SIU’s uniqueness. “Whether it is to boost SIU's success rates or truly help students obtain great jobs, SIU does a great job giving students opportunities,” Lohmann said. Above all, he is thankful for the various initiatives SIU provided him in terms of preparing him for his life after graduation, such as hosting career fairs, hosting guest speakers and giving students other opportunities to network with professionals. As an SIU alumna, I couldn’t agree more with my fellow graduates. Although I have been a Saluki for less than two years, SIU has captured my heart and added a great value and education to my life, in addition to lifelong friendships, unforgettable experiences and important connections for the future. On this note, please join the college in celebrating this milestone with all of the College of Business students who graduated this spring 2016, and to wishing the best of luck to all of them in their pursuit of happiness and their dreams.